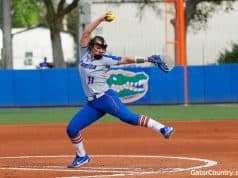 The Florida Gators softball team got off to a great start in the Kajikawa Classic after defeating Creighton 13-3 on run-rule. On top of their offensive outburst, the Gators also received a stellar pitching outing by freshman Lauren Haeger. She pitched 4.0 innings, only allowing one run on three hits. She also recorded eight strikeouts. Haeger got off to a rough start after allowing a second-inning homerun, but settled in quickly after that striking out seven over her first three innings. 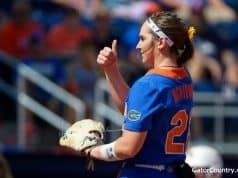 In five innings of play, the Gators racked up nine hits, including multi-hit performances from freshmen infielders Kelsey Stewart and Kristi Merritt. 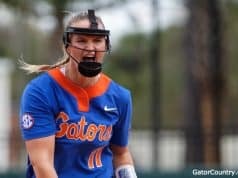 Merritt got the scoring started for the Gators when she singled in Stewart in the first inning. Right fielder Kelsey Horton pulled the Gators ahead in the third inning with a solo homerun. It wasn’t until the fourth inning the Gators softball team began to open up the game offensively. Stewart added to her hit total with a crucial three-run home run to give the Gators some breathing room, extending their lead to 5-1. Haeger held off Creighton in the bottom of the fourth with another strikeout and two more quick outs to sustain the Gators four-run lead. In the top of the fifth, Florida blew the doors open on Creighton. After an RBI double by senior leftfielder Ensley Gammel, which made it a 7-1 lead for the Gators, Merrit crushed a grand slam home run. The Gators added on a few batters afterward when an outfield error by Creighton allowed two more runs to score for Florida. Creighton added two more runs in the bottom of the fifth on their second home run of the day, but it was not enough to extend the game past the bottom of the inning as the Gators opened up the Kajikawa Classic with a 1-0 record. Florida plays Oregon tonight at 7:30 p.m. EST in their second game of the Kajikawa Classic.